Hey, Lanie! Where are you going all dressed up? The movies! I'm going to see Cinderella! You look just like Cinderella! Xyra and I are meeting her friend Lady Apple in a bit and I can't find my mittens. Have you seen the blue mittens? They go better with the red cloak. The scarf is over here with the cloak. Oh, they're here on the table. This is so cool! I can't wait! I love this poster. It's too bad it got a bit wet. Great seats! I have my popcorn and soda. I stopped at the concession stand on the way out - it was too full to get pictures before the movie. I love how they have the brass register and soda fountain. Looks like I was dancing a lot too. Huh? Oh. My. Goodness! What an exciting night! Not only did we see Cinderella, but also Frozen Fever! Both were great! Ella's mom and dad and house were beautiful. It was so sad how she ended up with a devious stepmother and two very odd step sisters. I learned three great things tonight: "have courage and be kind" and "believe." Loved the captain. The grand duke not so much. The king was a great dad. Fairy Godmother was FABULOUS! She really does know how to do shoes. And the gown! Who could forget the gown! All those puffy layers floating around during the dance...*sighs* A really good movie! I highly suggest it to all! Cinderella is my favorite Disney princess movie. I remember seeing it at Disney World when I was little. Jacques and Gus Gus are ever my favorites! Was Jacques female counterpart Jacqueline? I can't remember that. I do miss the little clothes on the animals, but this was really nice. One problem - the average lifespan of a mouse is 2 years (I've had many as pets). These lived so long with Ella that I started to think they were really animagi like Scabbers. I think I've seen almost every incarnation of Cinderella that has been made. A live action of the original Disney movie was a new twist. Very well adapted. It kept all the love and challenge and obstacles and hope and comedy. A few twists, but nothing outrageous (except the long lived mice). Some very touching additions. Cate Blanchett was superbly evil/conniving/devious as the step mother. The stepsisters were not ugly in their outward appearance (looked like residents of The Capitol, if you get my drift, as did their mother), but were pretty darn ugly on the inside and they let it show. Thankfully this prince was charming and sincere. Richard Madden's eye are captivating. Helena Bonham Carter is wonderful as the fairy godmother. Perfectly cast! There was not a bad moment in the movie. Some outstanding scenes included meeting the prince, going to the ball, escaping at midnight, the shoe fitting, and...have to keep somethings "secret." The theater erupted in applause at the end. Don't touch or take anything that is not yours. Leave lighted footwear at home. Whisper if you must comment to your friends. At the end, if someone behind you is still seated, they are trying to watch the credits. Move to the side, so they can see. Do you like to go to the movies? What do you get at the concession stand? 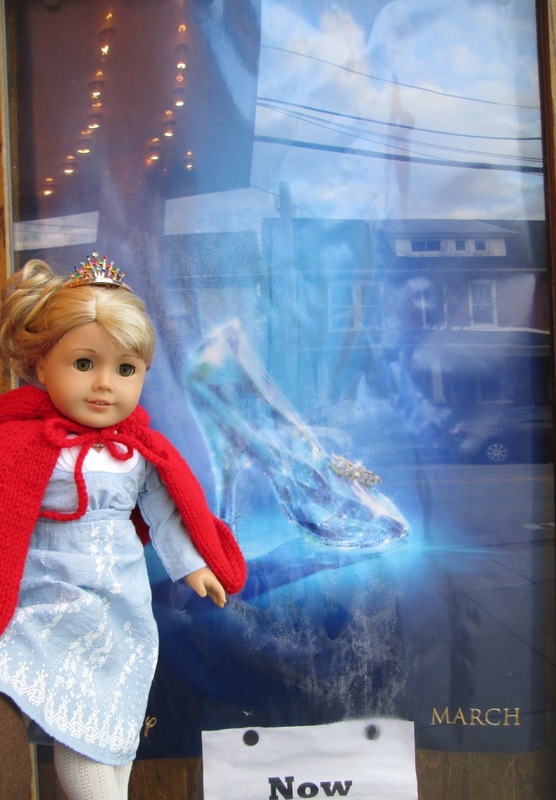 Have you seen this Cinderella? We're having fun with the kitties today. What kinds of things can you do to respect your cat? Hi! I'm working solo today. Well, sort of, I have support from the camera crew. (giggles) Today I want to look at a popular tea you can find in your grocery store - the tiny little tea leaves. That's right, Tetley. Tetley mentions five blends on their website. We found the classic black in our grocery store. You might be able to find British; green; black and green; iced tea; and, of course, decaffeinated. These three are recommended on the back of the classic box. The box contains 48 unwrapped tea bags. That means if you leave them like this they could lose flavor intensity over time. Or worse, take on flavors from other things. If your tea is unwrapped or in a paper wrapper, the best thing to do is put all the bags in an airtight container (FAQ What is the best way to store tea?). You can use an empty tea tin or Tupperware canister or a mason jar. Tea bags are pre-measured so you can put it right in your cup or mug. I'm using the glass pot so you can see the color. Put the bag in the pot, pour over the boiling water, and set the timer. You can steep as few as 3 minutes or as long as 5. I'm going for 4 minutes. It's already starting to give off a lovely color. Done! Look at that lovely dark, amber, brown color! It smells nice, but not floral, fruity, or overly malty. Just a nice combination. And now you see why I only did 4 minutes on the timer...I still have the bag in, so now it's been 5 minutes. (giggles) Remove the bag - squeeze all the liquid out if you want to; I did. I'm going to try it clear first; that's nothing added or plain. Mmm, nice. Not weak. Not too strong. Not bitter. Full body. I wonder what it would be like with some agave syrup? Oops! Too much agave. (giggles) Made it really sweet and the flavors shifted...it's a little more floral now. Time to try milk and sugar. Overall, you can't go wrong with this tea. It holds its own with additions and can also be enjoyed plain. I'm looking forward to trying to make iced tea with it when the temperatures get warmer. Hope you enjoyed, my review. The Tetley classic blend provides a nice cup of tea whose flavor and body pairs well with those who like it with or without milk. Plus if you want sweet tea, you can choose you favorite sweetener. It's a well rounded tea for any occasion. Quite enjoyable. Note: Tea Time with Melody Q is not affiliated with American Girl or Tetley Tea. The tea reviewed today was purchased at our local market. The above review is unsolicited and reflects our own opinions. All links provided are for educational and informative purposes; no purchase is required. Monday, March 23 was National Puppy Day. We missed it and the pups are telling us about it. I think they are also telling us we should mark the pet holidays on the calendar. So, I decided to search out National Dog Day and National Cat Day, but I found a LOT more! These are the ones we are marking on our calendars you can find more on Holidays and Observances. I'm not going to list the ones that have already past. I also found a list of all sorts of holidays. Did you know there is a Hula in the Coola Day and a National Tooth Fairy Day and a Talk Like Shakespeare Day? It's true! You can see the list on Holidays Calendar. 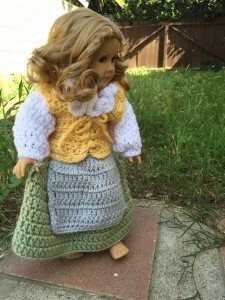 Jaclynn over at Little House of American Girl is celebrating her second blogoversary/ blogiversary (how do you spell that word?) with a giveaway. Are you a fan girl of The Hobbit and Lord of the Rings, then you want to check it out. Jaclynn crocheted the entire hobbit outfit. It looks ADORABLE! Entry deadline is March 30, 2015. Reading is so much fun. You can do it whenever and wherever you want to. Okay, maybe not - some places and times may be inappropriate, but you know what we mean. Wow! A trip to Hawaii to solve a mystery - that's a great gig to have. I think I would pack differently. This was a very interesting mystery to read. I'm so glad the entire team could work together on this one. Ah, Hawaii. A great place to read about at any time of year, but especially when the snow is falling in the northeast. I really liked that Nancy got to go on a vacation of sorts with her friends. The addition of the ghost dancer in this one was kind of spooky. Scavneger hunts are fun! This one was a bit dangerous too. It's a good thing the group could work together on solving clues and having each other's backs. Luau! Hula lessons! Hidden doors and compartments! Sand and surf! The only thing I didn't like about this book - the bad guys. They were so very greedy. The description of the gardens was wonderful. So much detail. The same with the leis. I was not happy with the icky lei; how could someone be so mean?! Ah, well, bad guys don't really have a conscience, do they. This was a great read and a fun way to escape to a new location without leaving home. This one was amazing; mostly due to the setting. I LOVE Hawaii and hope to get there sometime. In the meantime, the detailed descriptions in this mystery made me feel as if I were there. The main premise of this is not new to mystery readers - a grand inheritance going to one heir and suddenly other heirs try to prove themselves to get fast cash. Or treasure in this case. A grand treasure is tied to a sprawling Hawaiian estate, but the true heir is unable to figure out the first clue. He hires Mr. Drew to help prove the others are impostors and Nancy to find the treasure. The girls with chaperon, Hannah, head off to Hawaii; the guys are headed there with college. Meanwhile the bad guys do everything they can think of to thwart the young sleuths' efforts. Everything you expect from a Nancy Drew mystery, plus the wonderful Hawaiian hospitality and setting. There were a few measurements that seemed a bit off to me, but after doing a little research of my own found them to be a-okay. Have you been to Hawaii? If yes, what was your favorite part? If no, do you want to go? Don't forget to check out the Kid Lit Blog Hop. There may be a new author or book there for you to add to your "to be read" list. We didn't get to link in on that post, but there are over 50 other book reviews to check out.